Fourth Street Bridge Series is inspired by the negative space of the Trillium design motif repeated on the 1930's bridge. It is homage to the bridge construction, its view and history of the Los Angles River. The series of brooches in cement base honor the history of tribal indians, river views, 6th street bridge (now gone) and river conduit today, an excavation of sorts. The one of a kind brooches nest in the hand cast cement base with glass covers. 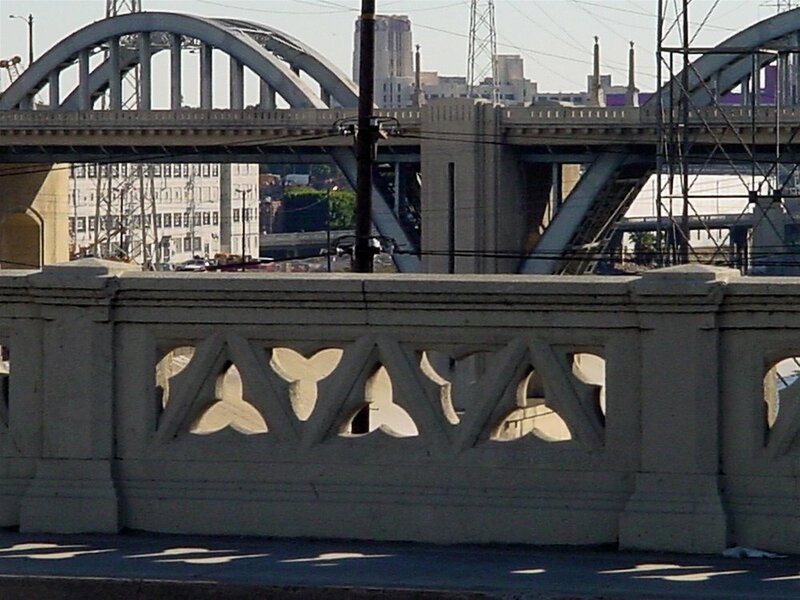 The Tiara " A walk on in the LA River", is both vessel and inspired by bridge lighting and trillium.Public Arts commission, "Arts District Medallion" , reflects the bridge trillium motif and area history of vinticulture and artists. Tiera photo M. Johann.